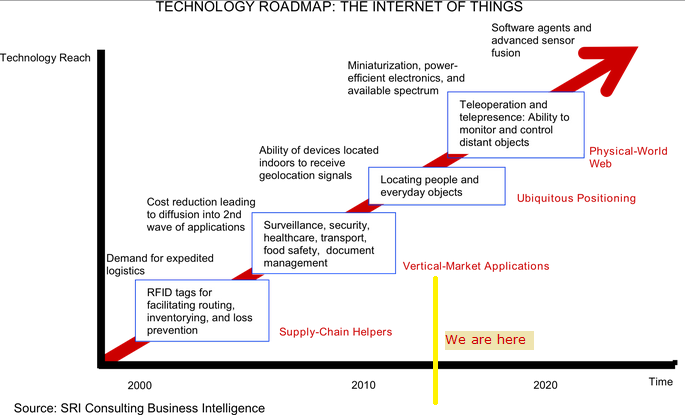 In few words Internet of Things is the global network connecting any smart object. 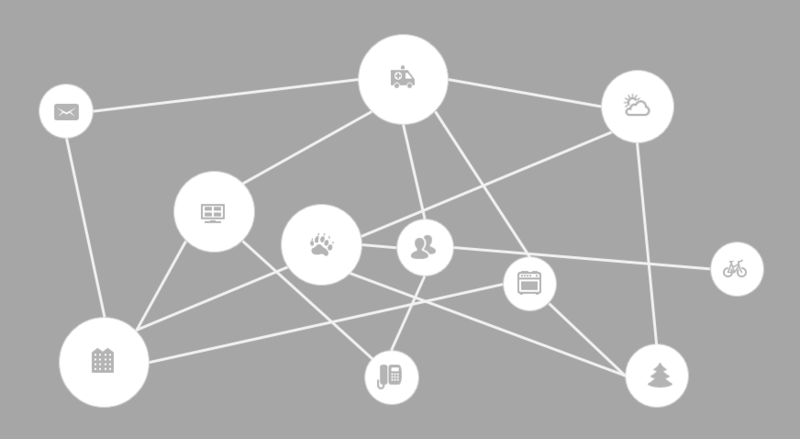 It is all about huge network of interconnected devices and sensors, their interaction. M2M (machine to machine) communication is very related term and is about underlying technologies for communication between devices utilyzing RFID, sensor networks, NFC, Bluetooth, Zigbee, WiFi and WiMAX etc. The ultimate difference from Internet-as-we-know-it is that nearby 50-petabytes of data currently available in Internet is almost all captured and entered here by human. Internet of Things data comes from Sensors. Some stats. Now (as of beginning 2013) about 2.2 billion of people use internet services. Analysts expect from 20 to 50 billion of interconnected devices by nearest 5 to 8 years (and only 5 billion of them are expected to be smartphones). What are others? ~1 Billion vehicles (smart transport), ~3 Billion utilities, the rest is smar homes and smart industries. When these devices are connected in smart way, it looks like “The Machine” is here. Assume billions of sensors and servers are the single brain. There is great video on TED about 5000 days of internet. For enterprises, IoT provides ability to control and improve manufacturing process, better automation, better analytics. From us, engineers and technology people and companies, IoT trend will require new skills, new technologies and new solutions. The main technology challenges for IoT include collection, management, analysis of huge amount of information, sensors, and networks, which traditional computing system are not able to solve. Assume the Machine is like the single human. There are main stages in information flow from outside world through our sensors to brain. 2. Channels. This is about M2M communication, new protocols, IPv6 adoption, Bluetooth, NFC etc. Trends there are higher-speed (more data), wireless (less cords), standardized (vendor independence). 3. Processing. As alternative to traditional OLTP and OLAP applications, new high-load systems are empowered with distributed big-data processing technologies, in-memory databases, smarter algorithms (e.g. growing use of video sensors raised new wave in evolution of image recognition technologies). What else? The latest, but very important piece is analytics and presentation of information (visual, audio, video) for humans. Since we do not expect The Machine to live alone, and want to use it for sake of smarter humanity, important decision will still be made by people. These decision will be supported by analytics – useful information, extracted from huge amount of data. Technology is emerging – look to MessageSight from IBM. There is also a lot of interesting reading I suggest (future of mobile UX, how we designed mEMR) on Vasyl Mylko blog. let’s build that virtual world together!